Busan (formerly transliterated as Pusan) is South Korea's second largest city (3.6 million inh. ; 4.4 million in metropolitan area) and an important sea port on the southern tip of the peninsula. 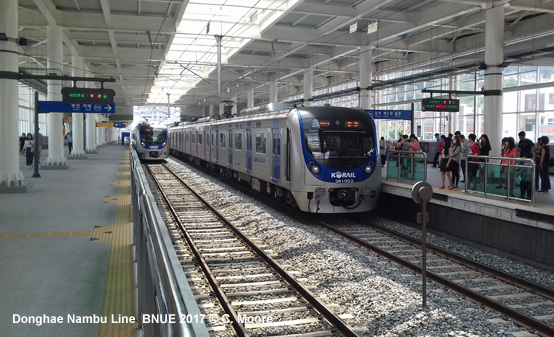 Despite its name, the BGL is a full standard-gauge metro line which connects Busan to the neighbouring city of Gimhae, via Gimhae Airport. 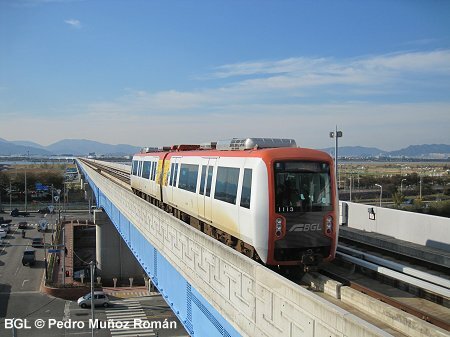 This elevated line is 24 km long, has 21 stations and is operated with 46 driverless cars delivered by Hyundai Rotem. 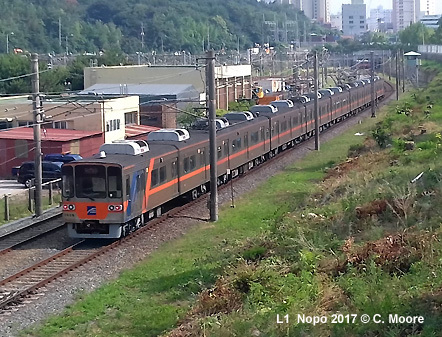 Upgraded suburban service along coast line, with trains every 30 min (15 min peak), to be extended to Taehwagang Station in Ulsan by 2018. Busan is located diametrical to Seoul, in the southeast corner of the Korean peninsula. A coastal city fringed by mountains, Busan is not a huge dense urban mass as is often the norm in Asia, but has grown its urban limbs around the coast and inland through the valleys. Naturally, the Metro has followed this development with 4 well-dispersed lines. 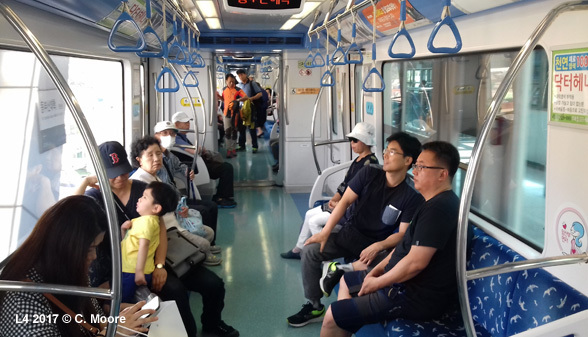 The system is also supported by an automated Light Metro in Gimhae to the west and a single east-west suburban rail line operated by Korail. There is a total of 167km of urban rail within the city. 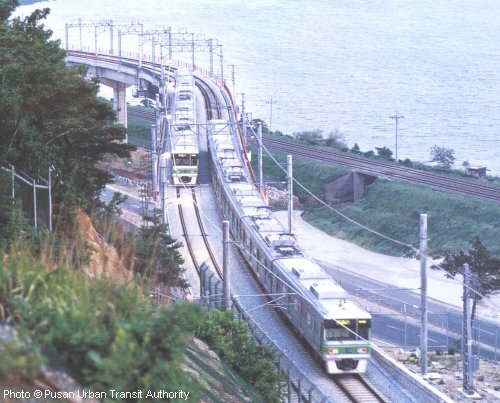 Branded the HuMetro, and operated by Busan Transportation Corporation, the Metro has 4 lines, with 115.8km of revenue track (88.9km of underground running). 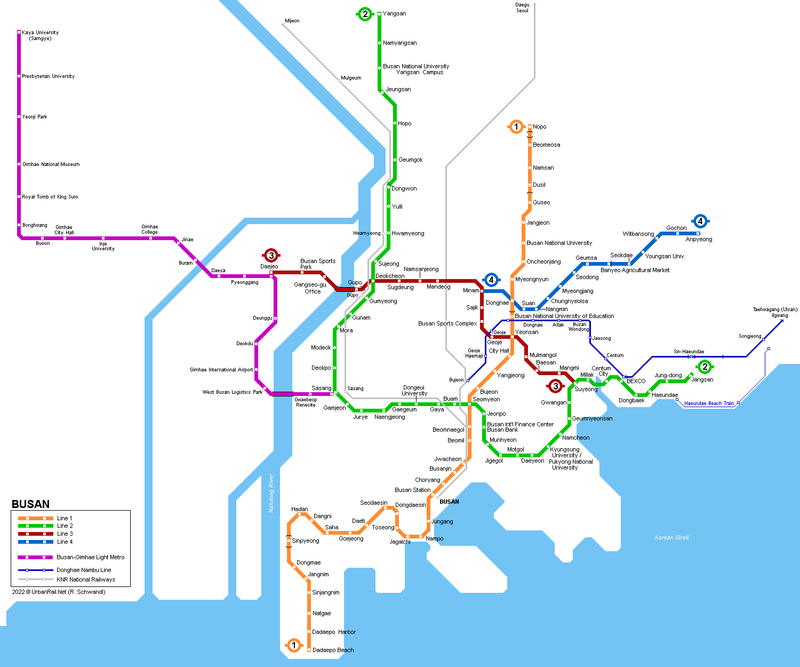 - Line 1 (40.4km/32.4km underground) (1h00) is the busiest line and runs southwesterly from the Nopo Transport Hub through the centre to Dadaepo Beach in the south of the main built-up area. A 0.5km grade section by the Nopo sheds moves underground until Dusil when a 6.7km (6 stations) elevated section shows of the valley and its dense urban environment. 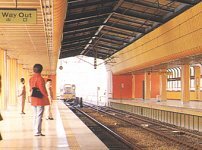 Stations here are located above streets and are quite large structures with rudimentary ticket hall and platform level. These have side platforms, three quarter screens topped with alternate very smart line strip and schematic map (the metro has virtually no wall schematic maps). 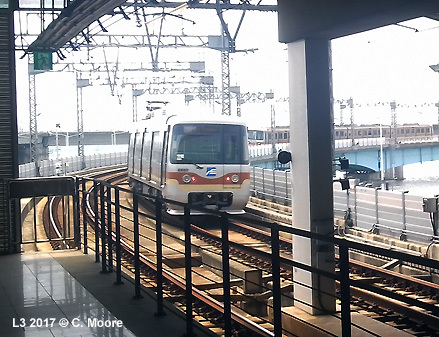 At BNUE the line again moves underground through the main central area, with interchange to Lines 2 and 3 and also stops at the main KTX station and ferry terminal as it meanders towards the former terminus at Sinpyeong. Here a 0.8km grade section provides access to the shedding facilities. The underground stations have street entrances with porticos and totems, basic ticket halls with location information, ticket machines, and information centre/operations room. Stations have mainly side platforms and a dated feel, with full screens, small pale and grubby tiling, dark brickwork, basic seating, and protruding stairwells (escalators are at a premium). Some stations do have patterned wall motifs to bring elements of individuality but, in general, this central section doesn’t jump out with any style. 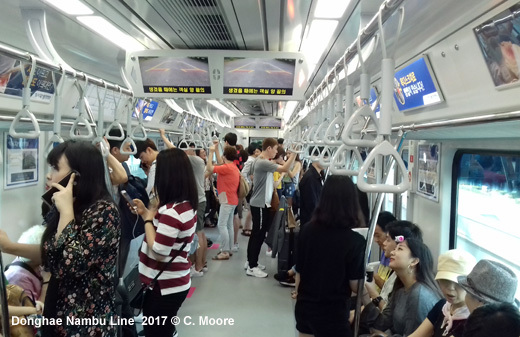 South of Sinpyeong lies the new extension (opened April 2017) and the ride here is notably smoother. These stations are a definite improvement with bright white glazed tiling, coloured panels, wall schematic maps (the only ones I saw) and escalators from the platform level. 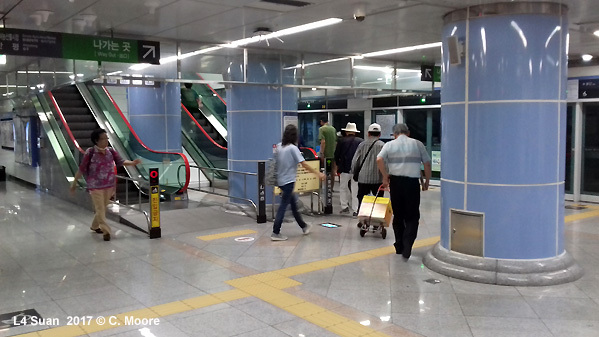 The ticket hall continues the bright theme, but the new stations still follow the basic outline of Korean stations and there is little design flair on this extension. The line operates 7min headways and uses 8 car Rotem sets. 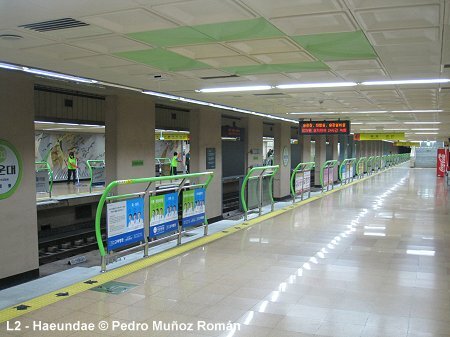 - Line 2 is the longest line on the system (45.2km/35.4km underground) taking 1h24 to travel. 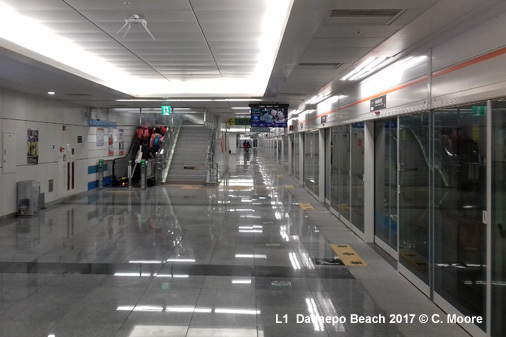 It serves the eastern coastal area including the main beach suburb of Haeundae, journeying west through the city centre, calling at the main station on the system, Seomyeon (Line 1). The line then moves north, straddling the Nakdong River and becoming elevated before Geumgok for the last 9.8km of the service. This area is less densely populated, the interest coming from the views of the river and mountains, the distant elevated infrastructure and the shedding facilities at Hopo. The stations (both underground and elevated) on this line are again quite simple with screens and standard furniture and information provision. This line also uses 8 car Rotem stock and operates at 7min frequencies during the day. 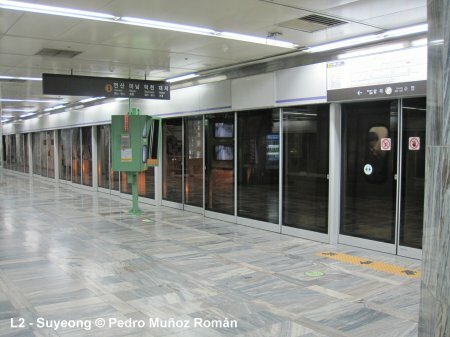 - Line 3 is the shortest full Metro line (18.1km/14.4 underground) (0h34) on the system and runs tangential from the Daejeo area in an easterly direction through Oncheon and then south to the Gwangan area. Despite its shortness, it is the only line to offer interchange with all urban rail provision in the city. 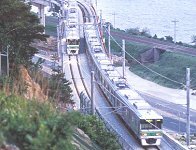 Providing interchange with the BGT line at Daejeo, the first 3.7km is elevated across the Nakdong River to the sharp bend before Gupo. 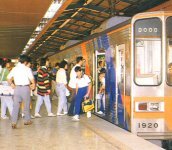 The line then runs eastward underground with transfer to Line 4, the Korail Line, Line 1 at Yeonsan, and the terminus of Suyeong for transfer to Line 2. 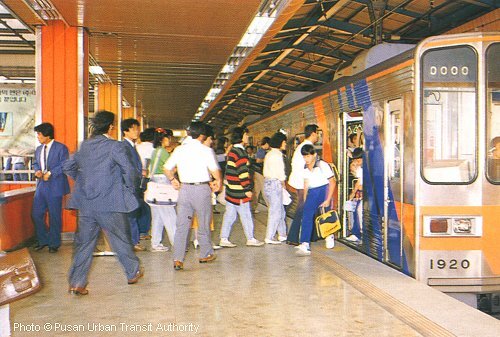 Operating 7min headways, this line opened 20 years after Line 1 and has a brighter feel, with marble effect flooring, less cramped and brighter underground stations and large, airy elevated stations. 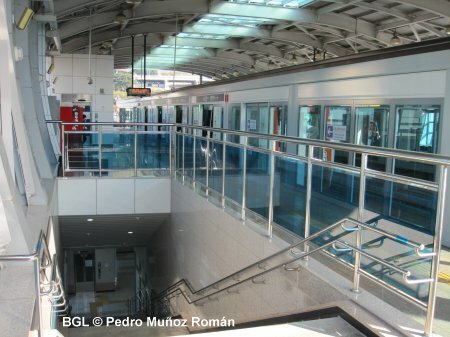 The line uses smart 4-car Rotem sets, although stations are built for 8-car trains. 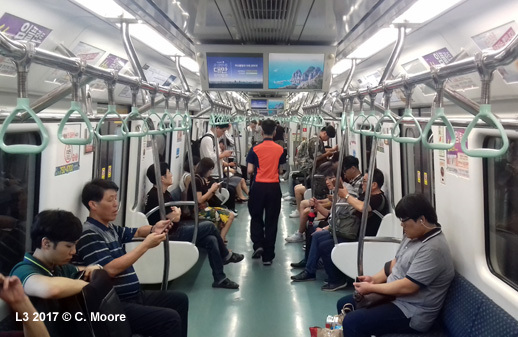 - Line 4 is very different from the other HuMetro lines in that it is an automated Light Metro with rubber tyres, and is powered by third rail. 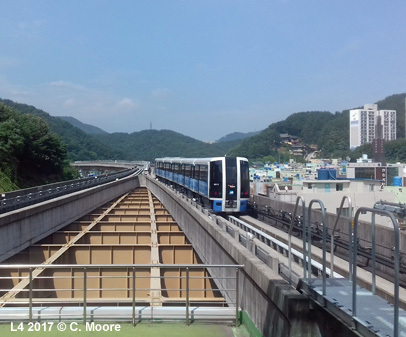 It runs from the Dongdae area (Minam and Dongnae have long transfers corridors between Line 4 and the other lines) through the northeast valleys to Anpyeong (12.1km/6.7km underground) (0h24). The service runs quite speedily and is well used. The stations are quite small with underground stations offering bold colours and a shiny feel, side platforms and full screens. Before Banyeo Market the line rises and although the station is fully roofed, the side walls are glazed with direct access to the streets outside. The line then becomes elevated as it undulates and meanders through the valley. Stations on this section have varied roof designs, island platforms and three-quarter screens. All stations are built for 8 cars but only 6-car sets operate, the individual cars being quite short. Headways are 8mins. 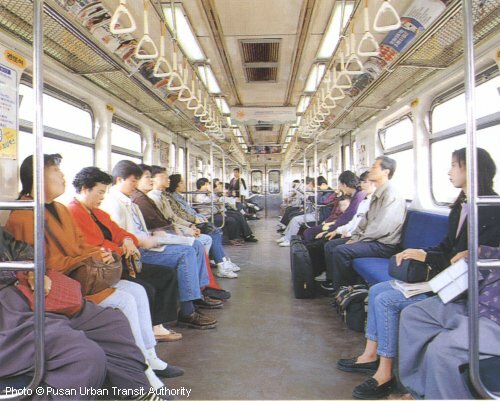 The metro system is well used and provides a very comprehensive service across the Busan urban area. It is also a very easy-to-use system. All directional and information signs, maps and electronic/audio information is provided in Korean, Japanese, Chinese and English and small fold-out system maps are available at all stations. The stock has side seating, with the full metro lines having very spacy Rotem stock, strip maps above doors (line and system maps on opposite doors). 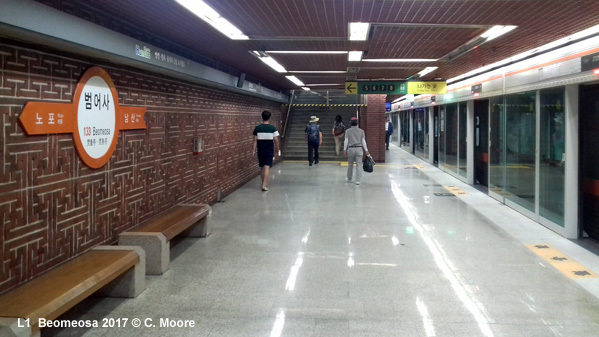 Stations are identified, as in the rest of Korea, by Line number-station (eg Station 122 is Line 1, station 22 = City Hall). 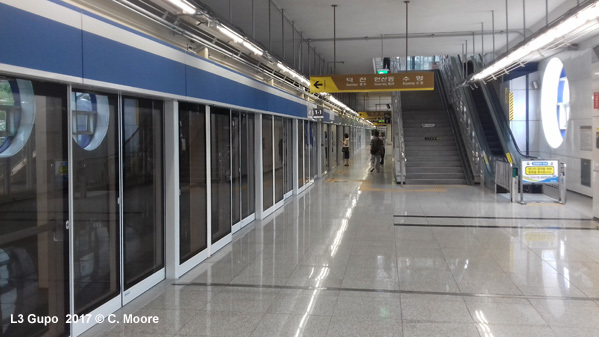 However, with the original Line 1 station (Sinpyeong) as 101 (Line 1-Station 01), then the subsequent 6-station extension southward has meant that stations have had to be labeled 100, 099, 098 etc – so this simple numbering system has come up against a problem – not that anyone seems to mind. The stations themselves are very noticeable at junctions and, although much of the system looks a little worn and has the typical ‘blocky’ style, with few clean lines and a dim feel, access and travel is very smooth. 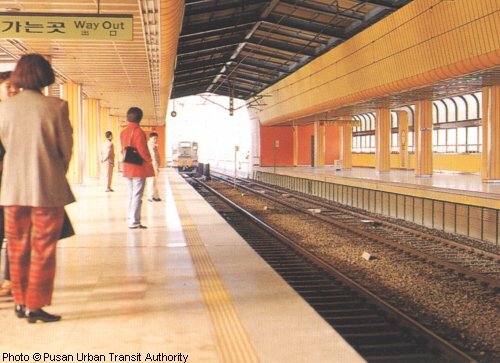 Although there is no RTI available on platforms (a musical rendition plays before a train is due to arrive – a cue to queue) headways are suitable and services operate from 0500-2300. Ticket machines are simple to use and offer small paper tickets. This is the only system in Korea to offer a day pass at 5000 Won, and coupled with the plentiful information this is the most visitor-friendly system on the peninsula. 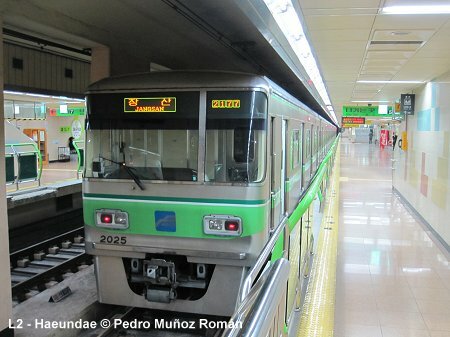 The HuMetro is supported by the Busan-Gimhae LRT line, serving the west and airport. Although there is transfer to the Metro and the line appears on all metro maps, it is a different system with different ownership and transfer requires a new ticket purchase. The line is elevated (23.4km/21 Stations) with great views all along the route and especially around the airport area. 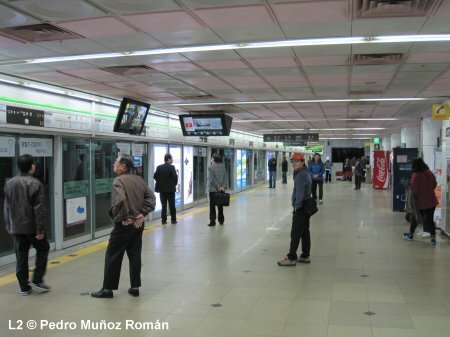 Stations have side platforms with half screens and the 2-car Rotem stock operates 6min headways. 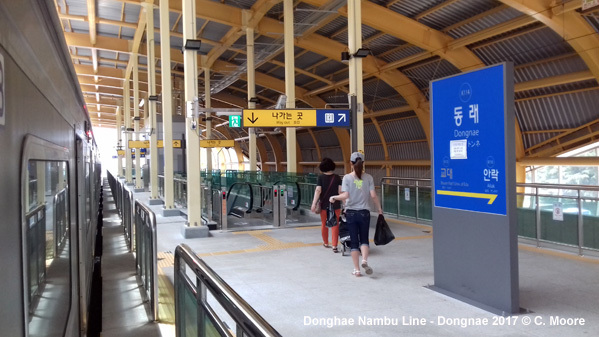 The latest addition to the Busan urban rail environment is the Donghae Line. This is 28.3km with 15 stations. 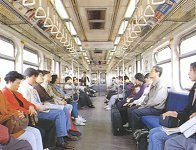 The service is operated by Korail as a commuter line and uses 4-car Rotem stock with side seating. The stations are squeaky clean and ‘new’ – they are large (overlarge) structures with high overhanging roofs, but with services every 30mins at non-peak periods there is quite a vacant feel to the line. The quite slow travel, long dwell times and semi-irregular timetables go to make this a little disappointing and a far cry from the Korail commuter lines in Seoul. The line does, however, serve different areas of the city and has ticket integration for locals with city RFID cards (for occasional visitors the system is barriered and new tickets are required). Overall, the city has a good mix of urban rail offer, and although it doesn’t score highly on style it is very visitor friendly and has great coverage of this pleasant city.